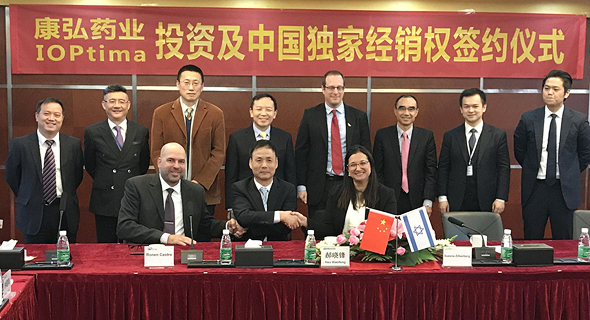 Shenzhen-listed Chengdu Kanghong Pharma Group Co. Ltd., a pharmaceutical company with a market capitalization of around $6.5 billion, solidifies its ownership of Tel Aviv-based medical technology company IOPtima Ltd. The China-based company paid $17.2 million for a 41% stake in IOPtima according to a company value of $42 million, the latter’s parent company BioLight Life Sciences Ltd. announced Thursday. The investment brings Chengdu Kanghong Pharma’s stake in IOPtima to 60%, as the company paid $7 million in November 2017 for a 19% stake in the Israeli company. Chengdu Kanghong Pharma will acquire the remainder of IOPtima in two additional stages, one set to occur in the second quarter of 2019 and the second in the second quarter of 2021. Established in 2002, IOPtima develops minimally invasive devices for eye surgeries. The company's flagship product, IOPtimate, is a laser-based a surgical system for the treatment of Glaucoma, a group of diseases that damage the optic nerve and result in blindness. The company has regulatory approval for marketing the system in several territories, including Europe, Canada, several Latin American and China.